Posted by Judy Orr on Thursday, October 4th, 2018 at 5:25pm. The requirements to secure a mortgage may seem overwhelming, especially if you’re a first-time buyer. But we’ve outlined three simple steps to get you started on your path to homeownership. Even if you’re a current homeowner, it’s a good idea to prepare in advance so you don’t encounter any surprises along the way. Lending requirements have become more rigorous in recent years, and changes to your credit history, debt levels, job type, and other factors could impact your chances of approval. It’s never too early to start preparing to buy a home. Follow these three steps to begin laying the foundation for your future home purchase today! Base FICO scores range from 300 to 850. 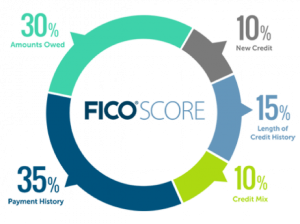 A higher FICO score will help you qualify for a lower mortgage interest rate, which will save you money.2 By federal law, you are entitled to one free copy of your credit report every 12 months from each of the three major credit bureaus (Equifax, Experian and Transunion). Request your free credit report at Annual Credit Report. Avoid Applying for New Credit You Don’t Need New accounts will lower your average account age, which could negatively impact your length of credit history. Also, each time you apply for credit, it can result in a small decrease in your credit score. The exception to this rule? If you don’t have any credit cards—or any credit accounts at all—you should open an account to establish a credit history. Just be sure to use it responsibly and pay it off in full each month. If you need to shop for a new credit account, for example, a car loan, be sure to complete your loan applications within a short period of time. FICO attempts to distinguish between a search for a single loan and applications to open several new lines of credit by the window of time during which inquiries occur. Pay Down Credit Cards When you pay off your credit cards and other revolving credit, you lower your amounts owed, or credit utilization ratio (ratio of account balances to credit limits). Some experts recommend starting with your highest-interest debt and paying it off first. Others suggest paying off your lowest balance first and then rolling that payment into your next-lowest balance to create momentum. Whichever method you choose, the first step is to make a list of all of your credit card balances and then start tackling them one by one. Make the minimum payments on all of your cards except one. Pay as much as possible on that card until it’s paid in full, then cross it off your list and move on to the next card. STEP 2: SAVE UP FOR A DOWN PAYMENT AND CLOSING COSTS The next step in preparing for your home purchase is to save up for a down payment and closing costs. Down Payment When you purchase a home, you typically pay for a portion of it in cash (down payment) and take out a loan to cover the remaining balance (mortgage). Many first-time buyers wonder: How much do I need to save for a down payment? The answer is … it depends. Generally speaking, the higher your down payment, the more money you will save on interest and fees. For example, you will qualify for a lower interest rate and avoid paying for mortgage insurance if your down payment is at least 20 percent of the property’s purchase price. There are a variety of other government-sponsored programs created to assist homebuyers, as well. For example, veterans and current members of the Armed Forces may qualify for a VA-backed loan requiring a $0 down payment.7 Consult a mortgage lender about what options are available to you. Current Homeowners If you’re a current homeowner, you may have equity in your home that you can use toward your down payment on a new home. We can help you estimate your expected return after you sell your current home and pay back your existing mortgage. Contact us at 708-536-8200 for a free evaluation! Closing Costs Closing costs should also be factored into your savings plan. These may include loan origination fees, discount points, appraisal fees, title searches, title insurance, surveys and other fees associated with the purchase of your home. Closing costs vary but typically range between two to five percent of the purchase price.11 If you don’t have the funds to pay these outright at closing, you can often add them to your mortgage balance and pay them over time. However, this means you’ll have a higher monthly payment and pay more over the long term because you’ll pay interest on the fees. STEP 3: ESTIMATE YOUR HOME PURCHASING POWER Once you have the required credit score, savings for a down payment and a list of all your outstanding debt obligations via your credit report, you can assess whether you are ready and able to purchase a home. It’s important to have a sense of how much you can reasonably afford—and how much you’ll be able to borrow—to see if homeownership is within reach. Home Affordability Calculator To get a sense of how much home you can afford, visit the National Association of Realtors’ free Home Affordability Calculator at Home Affordability Calculator. This handy tool will help you determine your home purchasing power depending on your location, annual income, monthly debt and down payment. It also offers a monthly mortgage breakdown that projects what you would pay each month in principal and interest, property taxes, and home insurance. Can I Afford to Buy My Dream Home? Once you have a sense of your purchasing power, it’s time to find out which neighborhoods and types of homes you can afford. The best way to determine this is to contact a licensed real estate agent. We help homeowners like you every day and can send you a comprehensive list of homes within your budget that meet your specific needs. If there are homes within your price range and target neighborhoods that meet your criteria—congratulations! It’s time to begin your home search. If not, you may need to continue saving up for a larger down payment … or adjust your search parameters to find homes that do fit within your budget. We can help you determine the right course for you. START LAYING YOUR FOUNDATION TODAY It’s never too early to start preparing financially for a home purchase. These three steps will set you on the path toward homeownership … and a secure financial future! And if you are ready to buy now but don’t have a perfect credit score or a big down payment, don’t get discouraged. There are resources and options available that might make it possible for you to buy a home sooner than you think. We can help.